These are the most notible locations in the RP, the Key locations if you will. The main Location of the RP. East of Equestria lies a land monsters and knights. Frontier Town settled by Earth ponies, Applaloosa has become a minor trade hub after settling a dispute with the local Buffalo tribes. Once a haven for bootleggers and criminals, Chicacolt, "The Whinny City" now boasts an impressive commercial district and great nightlife. Pegasus City in the sky and location of the Equestrian Weather Factory, primary producer for all of Equestria's weather clouds. Mysterious forest bordering Ponyille, containing the Castle of the Two sisters. Ponies cannot enforce any control on the weather of land. Here there be Monsters. Northern town settled besides a glorious waterfall. The Fetlock Falls draw in tourists and romantics from across Equestria to this otherwise sleepy town. Bustling commercial town and trade hub, Fillydelphia has recently undergone multiple hardships in the crossfire between the Leaf Cartel, the Manehattan Mob, and the Equestrian Guard. A highly successful trade city that has long served as a major crossroads for Equestria's northeastern towns. Resort Town and Hub of Entertainment in Equestria, with Gambling, Shows, Exquisite Food, and more. Simple Equestrian town hosting one of the world's greatest wonders, a living light show that occurs with every full moon. Big City hub of Equestria, Manehattan is amongst the largest and most modern cities in the country bustling with commerce, culture, and more. Seaside Resort town on Equestria's Coast, Myrtail Beach sits upon a glorious beach not far from a stunning coral reef. Capital City of Princess Marina and Seat of the Tides. Here there be Sea Ponies. A strange, persistent weather pattern makes this the coldest city in Equestria. But Stalliongradians don't mind because the world's finest vodka is made in their city. 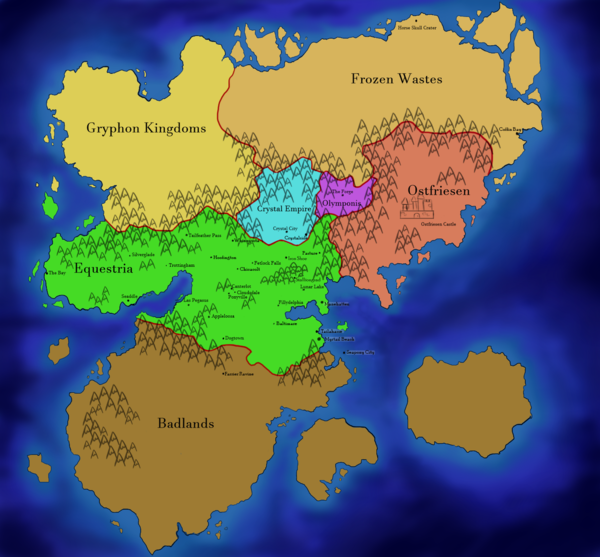 Mountain range bordering between western Equestria and the Gryphonlands. Multiple passes and trade routes cross the mountains at their peril. Coastal town which has long depended on the sea for its livelihood. A strong scientific community that sprung up around the nearby forest and the herbs- both medicinal and not- within. Northern Equestrian town built up through trade with the surrounding mining villages. Earth Pony-dominant. Winter Wrap-Up apparently nonexistant, not that anypony seems to mind. Capitol of the Crystal Empire, home to Princess Cadence, the Crystal Heart and the Crystal Ponies. An excavation town that has been digging up ancient crystal ornaments since before the crystal empire reappeared. Independent Port Town on the eastern coast of the Equestrian Continent. The community does extensive trade with foreign species from continents to the east for goods other beings may find less than legal. Once rumored to be a huge mountain, some terrifyingly large force fell to the ground here, smashing the mountain and leaving only a crater. Those who've seen it gave the place it's name due to the ominous shape the remains of the mountain have taken.